The EA8300's supports Linksys' standard "Smart Wi-Fi" feature set, which is described pretty well in the EA9500 review. The default wireless settings are shown in the screenshot below. While Linksys uses the Broadcom-coined "Smart Connect" term in its marketing material, here, it's called plain-ol band-steering. Perhaps due to the use of Qualcomm technology, the EA8300 defaults to band steering among all three radios (the Broadcom-based EA9200, EA9300 and EA9500 band steer only between the two 5 GHz radios). Turning band steering off exposes the controls shown below for all three radios, with the settings I used for testing. Linksys's routing features continue to lag far behind ASUS and somewhat behind NETGEAR's. 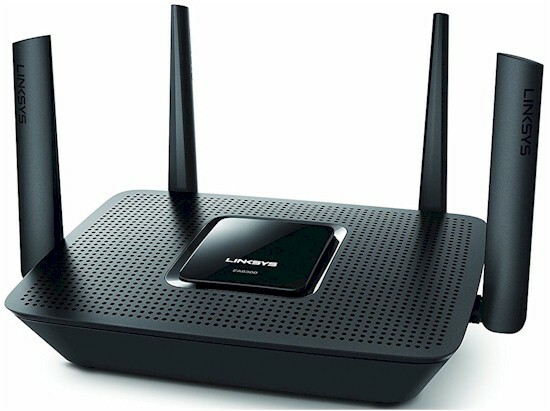 Like other EA series routers, the EA8300 does not support OpenVPN as Linksys' Marvell-based WRT routers do. However, non-WDS based Wireless bridging and repeating are supported, but hidden in the Connectivity > Internet Settings > Type of Internet Connection control. It's not clear from the User Manual, but if you assign unique SSIDs to the two 5 GHz radios, Linksys confirmed you should be able to link up a second EA8300 to get the equivalent of a two-node Velop. However, unlike Velop, the link between two EA8300s would be dedicated to backhaul. If you make your way to the Wireless > Advanced tab, you'll find an Airtime Fairness enable, which is off by default. Airtime Fairness provides a shot at improving total wireless bandwidth use by keeping slower devices from hogging too much air time. It's not a panacea, though, so you should experiment and see if it's right for you. Speaking of Advanced Wireless settings, the hidden advanced-wireless.html menu in the EA8300 brings up the page shown below, which contains no controls on either 2.4 or 5 GHz tab. So there are no controls to enable/disable beamforming, MU-MIMO or anything else. Our standard router storage test procedure was used to measure file copy throughput for FAT32 and NTFS volumes connected via USB 3.0. The NTFS results below are not much to write home about. They're about as good as the best performing routers produce with USB 2.0 connections. The EA8300 was tested with the V10 router test process, loaded with 1.1.3.184925 firmware. I threw in the EA9300's results to compare against Linksys' next step up in tri-band routers, which is Broadcom-based. I was somewhat surprised to not see the iperf3-based WAN-LAN and LAN-WAN throughput benchmarks top out at the 941 Mbps many other routers clock in with. But the HTTP and CTF Scores are where you want to focus. The numbers above are averages of scores for four file sizes. The plot below shows the per filesize results for the EA8300 and EA9300. The EA8300 actually out-performs the EA9300 in the smallest 2 KB file test, but can't keep up in the larger filesize tests. I don't know why the EA8300 doesn't handle the 108 KB filesize as efficiently as the EA9300. Comparing average Bufferbloat scores from the table above, average downlink bufferbloat was about the same, but average uplink and maximum bloat in both directions was worse than the EA9300's. Before you get too concerned, converting theEA8300's scores back to latency [(1/score) x 1000] yields 2.3 msec average WAN to LAN and 5.5 msec LAN to WAN. The 40 score for LAN to WAN converts to 25 msec. The Cut Through Forwarding tests look for throughput reduction when various router features are used. The 23.9% is the worst case throughput reduction measured when enabling the Media Priority feature and assigning the test computer as highest priority. Turning off the Connectivity > Administration > Express Forwarding featured (enabled by default) knocked down throughput to around 30% of normal. Using the Parental Control feature to block google.com for the test computer also slowed things to around 30% of normal throughput. The EA8300 is Wi-Fi Certified and was tested with the Revision 10 wireless test process loaded with 1.1.3.184925 firmware. The router was reset to factory default, then set to Channel 6 and 40 MHz bandwidth for 2.4 GHz and Channel 40 and 80 MHz bandwidth for the low band 5 GHz radio. The high band radio was disabled. WPA2/AES encryption was used for all connections. The Revision 10 process still uses 20 MHz bandwidth for 2.4 GHz tests for throughput vs. range, but uses 40 MHz for peak throughput tests. These settings are enforced by the octoScope Pal test client. I'll be comparing the EA8300 against two three-stream tri-band routers, Linksys' EA9300 and NETGEAR's R8000P. The 2.4 GHz downlink profile shows the two Linksys EA's tracking together and the NETGEAR following below until it meets up with the EA9300 around 30 dB. 2.4 GHz uplink shows distinctly different characteristics for all three products. The EA8300 has highest maximum throughput, but falls off a bit more quickly than the NETGEAR. The EA9300 is the poorest performer of the group in this benchmark. 5 GHz downlink clearly shows the EA9300 and NETGEAR with distinctly lower performance. The common element between the two is the use of Broadcom's relatively new BCM4365E radio SoC. Linksys questioned this result after the EA9300 review and suspected a problem with the octoScope Pal test client, which is Qualcomm-based. octoScope worked with Linksys and found the performance shown was, indeed, real and not in error. 5 GHz uplink shows all three products with similar performance characteristics. The octoScope Pal test client reported the maximum possible 2.4 GHz link rate of 400 Mbps for receive, but only 360 Mbps for transmit for the EA8300's 2.4 GHz tests. For 5 GHz, both receive and transmit link rates were the 866 Mbps maximum. As is now my practice, I did not test MU-MIMO performance, which makes even less sense in two-stream products. The EA8300 ranked #6 out of 13 routers tested with the latest Revision 10 process. That's notable because it's the only two-stream router in the Revision 10 ranker and beat out both three-stream NETGEARs (R8000 and R8000P). It also beat its more expensive three-stream EA9300 sibling. When looking at the ranking performance details below, keep in mind the ranker algorithm weights average wireless throughput and range scores significantly higher than peak and maximum benchmarks. The four-stream two-radio NETGEAR R7800 Nighthawk X4S remains the #1 ranked router, albeit at $40 more as I write this. So while it has decent wireless performance, the EA8300's real value will be for two different buyers. For folks who have good coverage, but are having trouble keeping up with the demands of too many wireless streamers in the household, the EA8300's second 5 GHz radio will add bandwidth capacity for less money than more expensive three and four-stream alternatives. The extra bandwidth can be used by wireless devices, or to link up a wireless bridge with its own bandwidth supply. For coverage-challenged buyers, the second 5 GHz radio can be used as a dedicated backhaul link to a second EA8300, or a tri-band extender like NETGEAR's EX8000, or Linksys' $60 cheaper RE9000. This makes a lot more sense than spending about the same, or more, for a four-stream AC5300/5400 tri-band router with all its radios stuck in one spot.